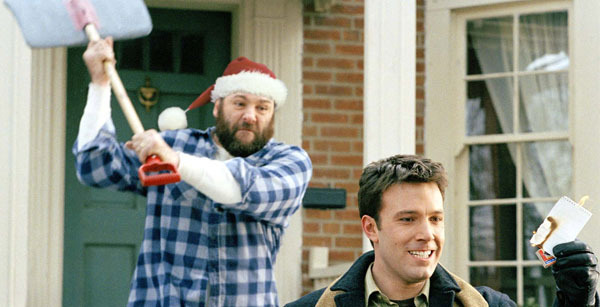 There is one great moment in SURVIVING CHRISTMAS that almost makes it worth the pain: James Gandolfini cracks a shovel over Ben Affleck‘s stupid head. This movie serves as yet another unfortunate example of James Gandolfini proving what a great actor he is whilst simultaneously besmirching his career by acting in this film. Drew buys off a family to spend Christmas with, on the condition that they pretend to be his own, insensately ignoring all the indications to the contrary that his money has not bought the emotions he was seeking. For $250,000, a surly suburban truck driver, Tom Valco (James Gandolfini), and his disheveled wife, Christine (Catherine O’Hara), agree to be Drew’s ad hoc family, against protests from their son, Brian (a very one-dimensional Josh Zuckerman) and daughter, Alicia (a very soft-focused Christina Applegate). Drew then spends the rest of the movie supposedly recapturing his youth or – something. The messages in this movie are as twisted and illogical as its dry-mouthed storyline. Fraught with overt psychoses, Drew plasters a fake smile on his face and blindly remains in denial against every denigration that he was supposedly buying the Valco family to avoid. Which begs the question: If Drew is paying these people to recapture some semblance of joyous familial emotion, how psychotic must he be to pretend happiness amongst their barbs and mental anguish over his presence? It is not a case of the Valco family hiding their true feelings and pretending to be happy while around Drew – three of the four members make it patently clear they despise him. Is he so incognizant that he cannot see his money is not buying him the “family” atmosphere he was inculcated into believing was a truth in the first place? As with all movies this opprobrious, one wonders how four screenwriters could possibly get so tangled in their own narcissistic dreams of appearing in a credits sequence that they will overlook any semblance of plausibility, or intelligence. Director Mike Mitchell, who was responsible for DEUCE BIGALOW: MALE GIGOLO – stop right there. ‘Nuff said. Gandolfini and O’Hara somehow manage to shine, proving their mettle amongst this mess. Christina Applegate is willowy and cutesy and blond and fiery in all the right places, scathingly cutting Drew into little strips of carcass for most of the movie, then doing an about-face and falling in love with him because the script tells her to. And I wouldn’t go so far as to say that Affleck is a bad actor, but Rob Schneider better look over his shoulder. There’s a whole new level of Desperately Seeking Talent in town. Writers: Deborah Kaplan, Harry Elfont, Jeffrey Ventimilia, Joshua Sternin. Starring: Ben Affleck, James Gandolfini, Christina Applegate, Catherine O’Hara, Josh Zuckerman, Bill Macy, Jennifer Morrison, Udo Kier.